I am thrilled to be the STEAM Studio teacher at Georgetown. I am a proud graduate of Michigan State University, however due to a lack of jobs in Michigan, my family moved to North Carolina. 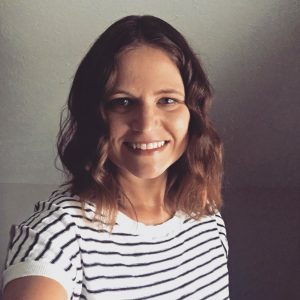 I have 15 years of teaching experience in grades K-8, including 5 years in a STEM lab. While in NC I became a National Board Certified Teacher and completed my Masters in Teaching and Curriculum through MSU. I had the opportunity to work with the Smithsonian, won a number of grants for my classroom, and was a top 20 finalist for the teacher of the year award for Johnston County while in NC. My husband and I have two sons, the oldest is a junior in high school and the youngest is in 7th grade. We are all big MSU fans and enjoy going to football and basketball games on campus. 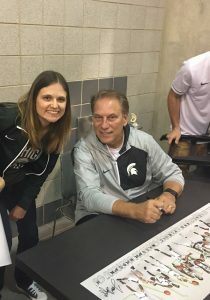 Meeting Tom Izzo last year was a dream come true! In my spare time I LOVE to read. I am a huge college basketball fan and hope to see the Spartans do great things this year! I love going out to eat at Chilis, Outback, and Chick-fil-A (best chicken ever!). I look forward to working with the families at Georgetown!